Bibimbap is a classic Korean mixed-rice dish. 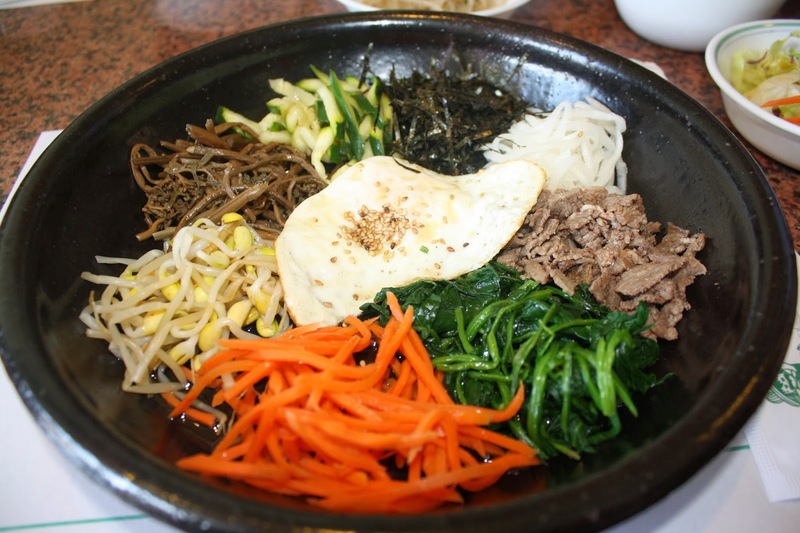 In traditional bibimbap, a large serving of rice is placed in the center of a hot bowl and surrounded with small amounts of meat — usually beef — and seasoned vegetables that include a mixture of cultivated vegetables (cucumber, carrot, daikon or turnips, spinach, lettuce, mushrooms) and wild items like fiddlehead ferns and reconstituted dried toraji (bellflower roots). A fried egg is often placed on top of the rice, and diners stir everything together. This recipe breaks with traditional bibimbap by using brown rice (you could also use barley, quinoa or another grain of your choice). As for the winter squash and spinach? The recipe is a template: use whatever vegetables you like. Featured in: Bibimbap: Rice Takes A Trip To Korea. Share the post "Bibimbap With Beef, Winter Squash, Spinach and Cucumber"
Wow, it looks yummy~ All ingredients mix up with harmony and create new taste! I want to be the good ingredient to be a wonderful delicious Bibimbap~!